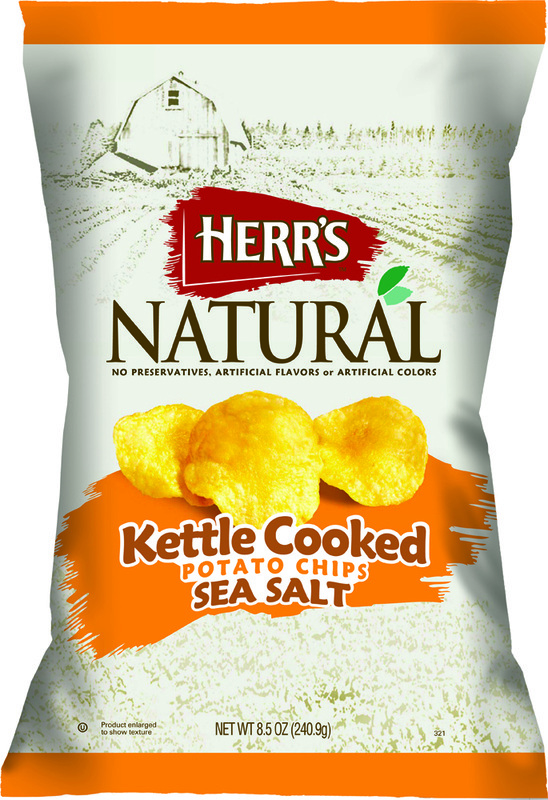 Herr's may have felt they needed to differentiate this bag from the almost identical 'All Natural' Chip in their Kettle Cooked range. They have therefore gone with a completely different design and made it look as though it was healthy. It is only marginally better for fat content and has the same sodium content, but a customer won't know this because this has the word 'Natural' written on it! If there is still any doubt, the tiny green leaves will confirm they are healthy! The washed out white background used on their other Kettle Chips looks good, but what the orange color has to do with anything it anyone's guess. This had a kind of crispy crunch to it. Although Kettle Cooked, they seemed a little thinner than many of the Kettle Chips on the market. A small handful was like putting a brass band in the mouth - a cacophony of sound. However, it was more like eating regular Chips than Kettle Cooked Chips. Admittedly, these Chips were not tested at the same time, but within a week, so we don't believe our memories were playing tricks. It seemed like the same Chip texture to us. The write up stands for this virtually identical tasting Chip. It says it has marginally less saturated fat, but we didn't notice in the flavor department.